We live today in constant motion, traveling distances rapidly, small ones daily, arriving in new states. In this inaugural edition of Freeman's, a new biannual of unpublished writing, former Granta editor and NBCC president John Freeman brings together the best new fiction, nonfiction, and poetry about that electrifying moment when we arrive. Strange encounters abound. David Mitchell meets a ghost in Hiroshima Prefecture; Lydia Davis recounts her travels in the exotic territory of the Norwegian language; and in a Dave Eggers story, an elderly gentleman cannot remember why he brought a fork to a wedding. End points often turn out to be new beginnings. Louise Erdrich visits a Native American cemetery that celebrates the next journey, and in a Haruki Murakami story, an aging actor arrives back in his true self after performing a role, discovering he has changed, becoming a new person. 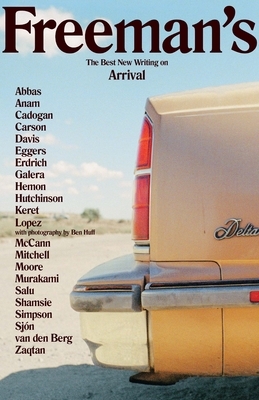 Featuring startling new fiction by Laura van den Berg, Helen Simpson, and Tahmima Anam, as well as stirring essays by Aleksandar Hemon, Barry Lopez, and Garnette Cadogan, who relearned how to walk while being black upon arriving in NYC, Freeman's announces the arrival of an essential map to the best new writing in the world. John Freeman was the editor of "Granta" until 2013. His books include "How to Read a Novelist" and "Tales of Two Cities: the Best of Times and Worst of Times in Today's New York." He is an executive editor at The Literary Hub and teaches at the New School. His work has appeared in the "New Yorker," the "New York Times" and the "Paris Review."